Treat yourself to a deep-kneading massage for your neck, shoulders, back, or anywhere you need it. The HoMedics® Ultra Plush Shiatsu Pillow provides relaxing Shiatsu massage in a soft, comfortable pillow that is easy to use anywhere on your body. The stylish and plush pillow design blends seamlessly with any decor so Shiatsu massage can be within reach at any time. The compact design also makes it convenient to take with you anywhere you go. I'm a mom...so of course, there are days when I wish I could go to a Spa, get a massage, and take a little break. Reality is I rarely have those opportunities to get away, so I try to find new ways to relax and rejuvenate from home. A nice bath, some quiet time reading a book or my favorite magazine; and now my new favorite way to relieve stress? The HoMedics Ultra Plush Shiatsu Pillow! Beautifully soft, all I have to do is plug the Ultra Plush Shiatsu Pillow and sit back on the sofa with a good book, my favorite television show, or even while I get some work done on my laptop....and I can get a professional quality Shiatsu Massage in my own living room! Wonderfully relaxing, the Ultra Plush Shiatsu Pillow also has the option to add heat to the massage (a gentle warmth ), perfect for the chilly Winter months. For a little relaxation without the need for a babysitter and a day away at the Spa....check out the HoMedics Ultra Plush Shiatsu Pillow; every mom should have one! 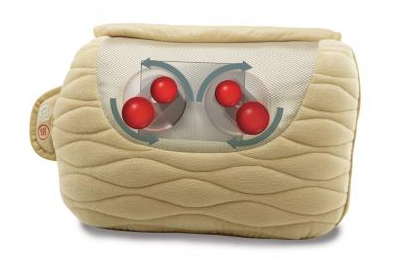 BUY IT:You can find the HoMedics Ultra Plush Shiatsu Pillow at http://www.homedics.com/ and at a retailer near you.